Home Culture Classifications Culture & LIFESTYLE Ever heard of this ‘Most Bizarre Traditions From Around the world. Funerals can be expensive and families don’t always have the funds available to pay for a burial when a loved one passes away. So what do you do’ Well the Toraja people of Indonesia have a very unique way of dealing with this. If they can’t afford a burial, the corpse is instead dressed in garbs and placed in a temporary coffin inside the family’s house. The family lives with their dead relative until they can save up enough money for a proper burial. When this time comes do they simply pick up the coffin and carry it to it’s new resting place’ Oh no! That’s no fun. They instead raise the corpse from it’ s temporary coffin and ceremoniously walk the cadaver to it’s final resting place, which could be miles away. Giving a whole knew meaning to life after death. 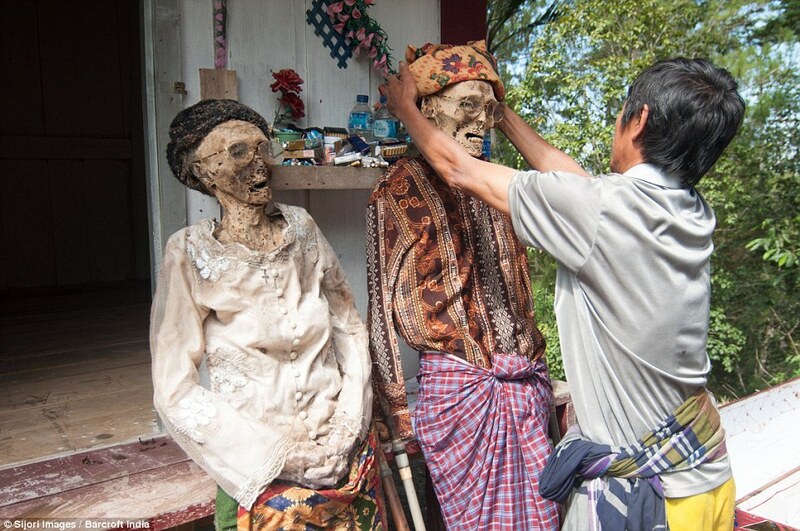 They say the dead live on in our hearts and minds – but in one Indonesian province, the deceased continue to walk the earth in a rather more literal, zombie-like fashion. Even dead children are exhumed – two of these photos show the skeleton of a baby wrapped in a print dress with a doll laid next to it. The ritual is called Ma’nene, or The Ceremony of Cleaning Corpses. Next articleLadies, The Smarter You Are, The More Likely You Are To remain single.